O.co Coliseum is the site of the matchup between the Texas Rangers and the Oakland Athletics on Saturday, August 26, 2017. The probable starting pitchers are Cole Hamels for the Rangers and Sean Manaea for the Athletics. Texas opens at -118 while Oakland opens at +108. The Rangers have a 56-68-3 over/under record and a 72-55-0 run line mark. The Athletics are 65-62-0 against the run line and have a 67-56-4 over/under record. The Rangers have a 64-63 overall record this season. Starting pitcher Cole Hamels has a 9-1 record with an earned run average of 3.42 and a WHIP of 1.08. He has 65 strikeouts over his 105.1 innings pitched and he's given up 81 hits. He allows 6.9 hits per 9 innings and he has a FIP of 4.45. The bullpen has an earned run average of 4.33 and they have given up 400 base hits on the year. Teams are hitting .258 against the bullpen and they've struck out 377 hitters and walked 175 batters. As a team, Texas allows 8.9 hits per nine innings while striking out 7.1 batters per nine innings. They are 15th in the league in team earned run average at 4.45. The Rangers pitchers collectively have given up 1,104 base hits and 554 earned runs. They have allowed 167 home runs this season, ranking them 11th in the league. Texas as a pitching staff has walked 436 batters and struck out 878. They have walked 3.5 men per 9 innings while striking out 7.1 per 9. They have a team WHIP of 1.38 and their FIP as a unit is 4.81. As a team Texas is hitting .246, good for 25th in the league. The Rangers hold a .438 team slugging percentage and an on-base percentage of .324, which is good for 16th in baseball. They rank 26th in MLB with 8.3 hits per game. 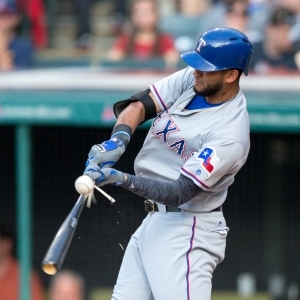 Elvis Andrus is hitting .295 with an on-base percentage of .338. He has 148 hits this season in 501 at bats with 66 runs batted in. He has a slugging percentage of .469 and an OPS+ of 108. Nomar Mazara is hitting .260 this year and he has an on-base percentage of .338. He has totaled 112 hits and he has driven in 83 men in 430 at bats. His OPS+ is 101 while his slugging percentage is at .437. The Rangers have 1,041 hits, including 188 doubles and 198 home runs. Texas has walked 430 times so far this season and they have struck out 1,144 times as a unit. They have left 786 men on base and have a team OPS of .762. They score 5.09 runs per contest and have scored a total of 641 runs this year. Oakland has a 55-72 overall mark this year. With an earned run average of 4.58, Sean Manaea has a 8-8 record and a 1.36 WHIP. He has 114 strikeouts over the 125.2 innings he's pitched. He's also given up 128 hits. He allows 9.2 hits per nine innings and his FIP stands at 4.14. The bullpen has an earned run average of 4.66 and they have given up 413 base hits on the year. Teams are hitting .248 against the Athletics bullpen. Their relievers have struck out 419 batters and walked 161 opposing hitters. As a team, Oakland allows 9.1 hits per nine innings while striking out 7.6 batters per nine innings. They are 24th in the league in team earned run average at 4.74. The Athletics pitchers as a team have surrendered 1,135 base knocks and 592 earned runs this season. They have given up 163 home runs this year, which ranks 12th in Major League Baseball. Oakland as a staff has walked 395 hitters and struck out 953 batters. They give up a walk 3.2 times per 9 innings while they strike out 7.6 per 9. Their team WHIP is 1.36 while their FIP as a staff is 4.50.